How efficiently does your organization handle calls from prospects and customers? OnSIP’s Enhanced Queue Dashboard displays the status of agents and callers in your organization's call queues. Also capable of running key performance reporting, this interface helps your business improve operational efficiency and deliver excellent customer service. 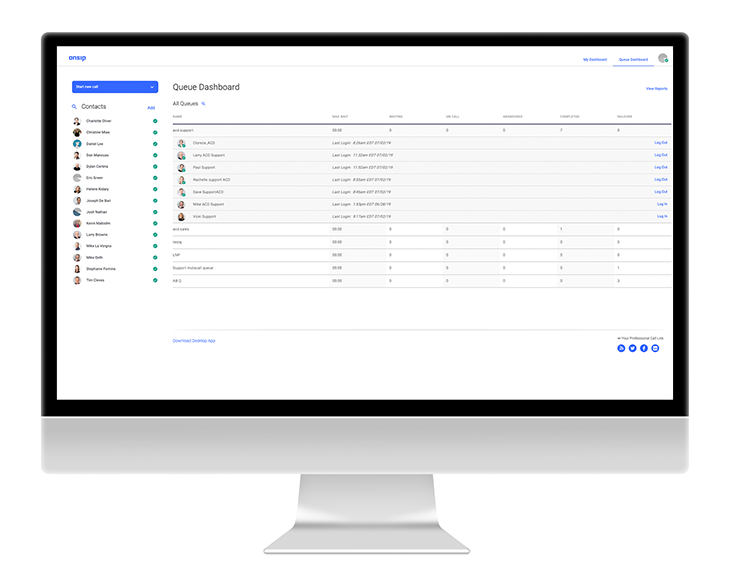 With the Enhanced Queue Dashboard, you will gain the confidence to make informed decisions on staffing and training your sales and support teams. Monitor - Queue supervisors can listen in (in real-time) on any agent that is on a call. Neither the agent nor the caller will know the supervisor is listening. Whisper - While listening in on a call, queue supervisors can speak to the agent without the caller hearing. Barge - Queue supervisors, while listening in on a call, can barge into the call and directly speak with the agent and the caller.